Layer the bend into a pot of compost. it will root from there then you can cut it away from the parent plant. Then add a stake to help it grow straight. memory of their popularity in the 1970's, was it was grown up a moss pole. But if you really don't like it see if a local care home would like it. then when visitors arrive and they ask about it say it had outgrown its space and instead of binning it you donated it. If you can be bothered with the faff, plant the wonky top with the roots, still attached, in a pot next to it, and when it roots, cut it free. 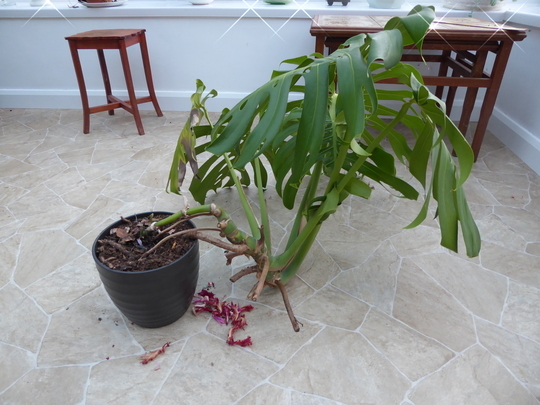 We had a pet rabbit who got into the house via the cat flap and chopped my Monstera 'tree' at the bottom. It did survive for a couple more years after that. Failing that, tell the donor that you tried everything but gave it a good send off! Oops Seaburn you posted while I was typing. Or maybe I could buy a rabbit instead Cammomile!